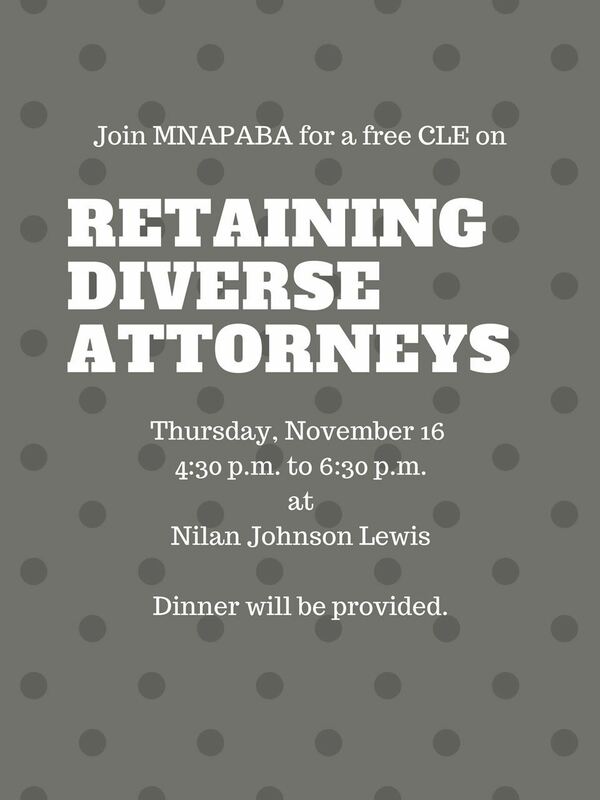 Join MNAPABA on November 16 from 4:30 p.m. to 6:30 p.m. for a free CLE on retaining diverse attorneys. This event has been approved for one Elimination of Bias credit. Dinner will be provided. Ann Jenrette-Thomas from Stinson Leonard Street will be moderating. From 4:30 p.m. to 5 p.m. there will be mingling and checking in, as well as grabbing dinner. From 5 p.m. to 6 p.m. the panel will convene. From 6 p.m. to 6:30 p.m. there will be networking over drinks. Please contact Sukanya Momsen, Vice President of Outreach and Development, with questions at smomsen@nilanjohnson.com.